Press moulded slipware ramekin with matching saucer. Roundel moulding to exterior and on saucer. Deep blue gloss glaze to entire body. Very good with small fleabites to rim of ramekin. Soda Tree Café and Collectables, Montrose Victoria 10 Dec 2011. A Staffordshire Winter is usually wet and cold; a fitting backdrop to what was about to happen. Under clear skies, on Friday the 11th February 2000, Angela Tams visited all five premises operated by Tams Ltd to shake hands and personally say goodbye to all 730 workers. Still desperately sad and grieving after the death of her husband Gerald, who had lost his six-year battle with stomach cancer the previous October, Angela, former Deputy Chair had taken over from him as Chair of one of the last great family owned pottery works in England. Gerald had planned to retire the following September on his 60th birthday. He didn't make it. Unfortunately, Lloyds Bank called in their loans and Tams were unable to pay. The Receivers from KPMG had moved in and the premises closed. If you visit the area, you can still wander around their deserted factory piled with the now dusty unfinished crockery, moulds and paperwork. Tams had operated as a pottery in Staffordshire from 1875 until 2006. The company had been started by John Tams after splitting with William Lowe in Longton in 1873. John and William had gone into business together about 1865 at the St, Gregory’s Pottery, High Street Longton. John was the son of James Tam and his wife Anne (Proctor) and was born in Stafford Street Longford in 1837. In his youth, John was apprenticed as a potter, and after his partnership with William Lowe was dissolved, John bought the Crown Pottery in Longford at the corner of Commerce and High Streets. John married Mary Kent, the daughter of Charles Kent, a draper, of Red Bank Cottage, Dresden, where John Tams and his wife were living in 1881. Later they lived at St. Edmund's Villa, Ricardo Street, and from 1898 at The Hayes, Stone. They lived in Trentham and went on to have four children, John, Mary, Joseph and Dinah. John retired from the business in 1918 and died on the 17th May 1919. Gerald Tams, Managing Director was the great grandson of the founder and had spent four years studying for a Diploma in ceramics at the Staffordshire Polytechnic. For over 20 years he had worked in every area of the family business. Gerald and his cousin Paul Tams, former Director and Sales Manager, had been groomed to take over the works since they joined in 1960. In 1984, Gerald bought out Paul who went on to become a Farmer. He also bought out another eight family members. Following this, Gerald moved from earthenware to making bone china. Sales increased and the 1980s became the most profitable in their more than 100 year history. Institutions were more than happy to buy shares. In 1988, Gerald had bought “Duchess China” at a bargain basement price and by the early 1990s, sales exceeded ₤30m. Crown Lynn (New Zealand) bought Royal Grafton Fine China from Tams in the early 1970s. (More likely they just bought the name as the Royal Grafton factory closed in 1972) The New Zealanders were looking to expand into the UK and saw the acquisition of a local works as way of circumventing import quotas. They believed that the Ottowa Agreement had made it difficult for New Zealand to compete in Britain. They saw this acquisition as a means of accessing the US market. In 1960, almost half of New Zealand’s ceramic production was exported to the U.K, yet thirty years later, almost all was imported. Corporate neglect has been blamed for the ultimate demise of Crown Lynn. On the 5th of May 1989 it was announced that Crown Lynn would close. The plant and equipment was sent to Goh Ban Huat Berhad in Malaysia. Curiously, Temuka Homewares, part of Pacific Retail Group Ltd is a good selling line of ceramic tableware. Pacific are the owners of Ceramco who bought out Crown Lynn. These ramekins are typical of the period and are similar to those made by Crown Lynn. In 2002 Tams was the biggest ceramic employer in Longton and one of the biggest mugs manufacturers in Europe. 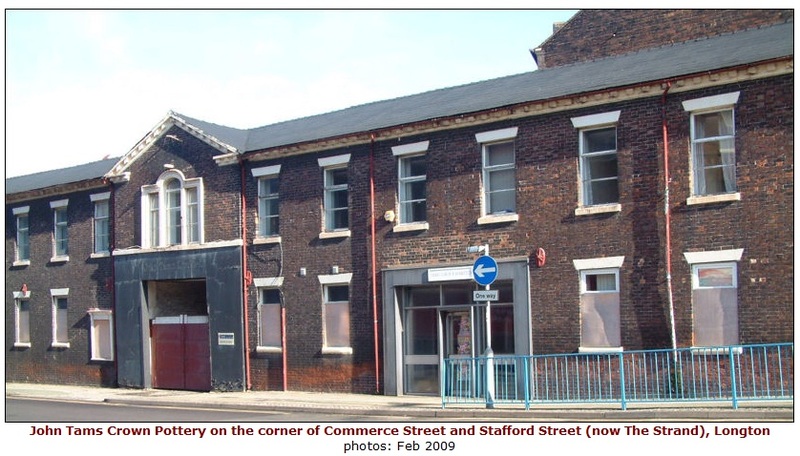 The company’s principal works was the Crown Works at what is now the Strand in Longton. 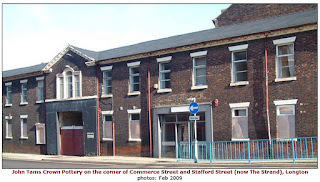 They also had the Blythe, Sutherland and Atlas works in Longton, plus a warehouse at the old Monarch flatware site in Fenton; Tams Group Limited having been formed in April 2000. It was a management buy in of part of the former John Tams Group PLC, that went into receivership in February 2000. In 2006 that group again went into receivership and finally closed. The company had fallen victim to the strong value of the Pound, cheap Asian imports and a declining domestic market due to the increased use of plastics. The company had always exported to Australia and other Asian countries but these markets had also contracted sharply. The company had always been run by the Tams family; even after it went public in 1988, four years after Gerald had organized a buyout in 1984. The family still owned 70%. Tams Group Ltd had purchased the rights to Tams, Royal Grafton and Grafton Living from Alfred B Jones and Sons Ltd, marketing these brands and still manufacturing in Longton, Stoke on Trent. Sadly, debts led to the company being placed into receivership when their overdrafts, said to be around ₤2.5million, were called in. The Tams brand continued for a further six years when the company name was bought out and they carried on with mug production until 2006 when further financial problems signaled the end of the Tams name. Angela went on to become High Sheriff of Staffordshire in 2006, the role being mostly ceremonial and later Deputy Lord Lieutenant of Staffordshire. Since 2008, she was a volunteer with the charity "The Compassionate Friends." She has now retired, But at age 68, don't count her out yet.